This is a bathroom that goes above and beyond a small space for passing through. The designer has put her creative and architectural knowledge into "his and hers", individual spaces making the room, not only functional but beautiful too. 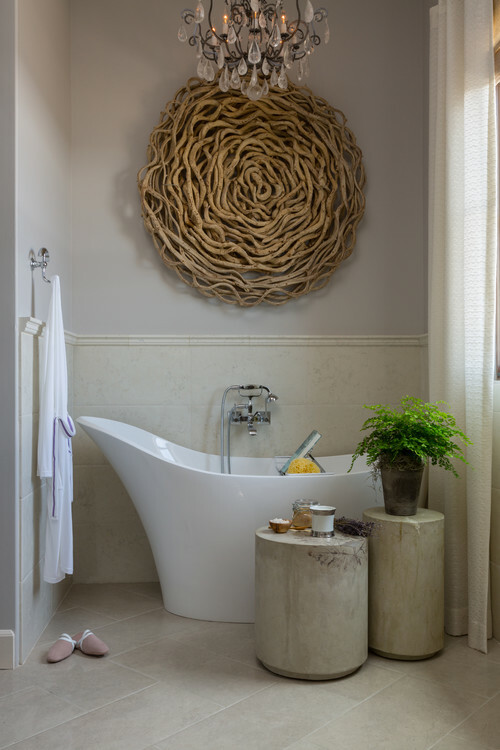 I was browsing at bathrooms on Houzz and spotted this beautiful ensuite bathroom by designer, Cindy Smetana. Cindy has individualised his and hers sides of this master bathroom which includes walk in closets and a unique coffee bar. Cindy has also created a spa like bath area which you can see in the image above. Separate vanities and a cute dressing table extension off the ladies vanity are extra features. There is plenty of room for those decorative items that makes the space feel more like an extension of the bedroom. One clever feature is how Cindy has used decorative tiles to determine the mans vanity from the ladies, the ladies being more decorative. Having everything matching can look dated, these unique tiles bring individuality to the space, yet it works with the overall design. Adding foliage to a bathroom takes it to the next level without spending a fortune, it makes the space feel more indulgent and spa like. Orchids are fantastic for bathrooms, they love the moist air and thrive in them. It makes sense to go a little more modern with the choice of bath even in a traditional style bathroom and Cindy has chosen a modern take on tradition with the beautifully curved, free standing bath. This corner definitely has that spa like feel we yearn for in a bathroom. Cindy has carefully thought out some fabulous storage for towels and linen. 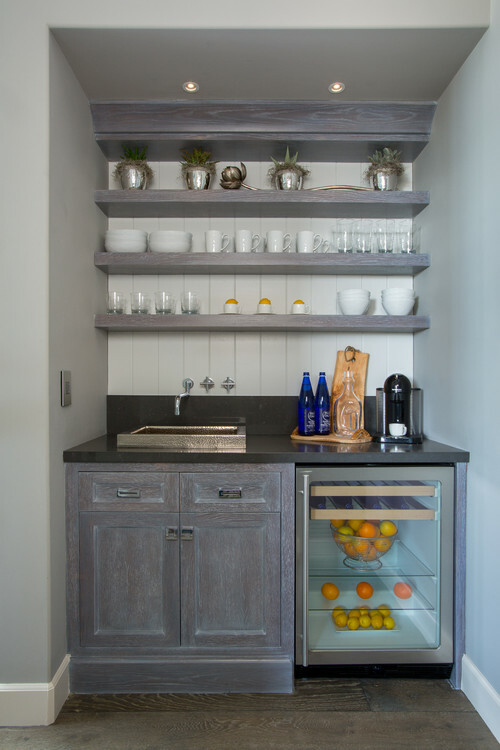 If you have the space for built in shelves or cupboards, they are must. Who wants to shout from the bathroom for someone to bring a forgotten towel or run with dripping wet feet looking for that towel that's way down in the hall cupboard. Throw out those frame-less glass mirrors that screw to the wall and think about gorgeous bevelled glass and decorative frames. When it comes to artwork, don't neglect the bathroom, however, do think about the affect steam might have. Acrylic paintings on board should stand up to steam, however I wouldn't go hanging a Picasso. It is important to have a very good extractor fan in a bathroom. We have ones designed to go above our showers at our beach house which proves more effective than placed in the centre of the bathroom. Above: His and hers vanities do not have to be side by side although it is cost effective for plumbing. This gorgeous ensuite has his and her vanities at different points of the room as Cindy opted for each to have their own space adjacent. 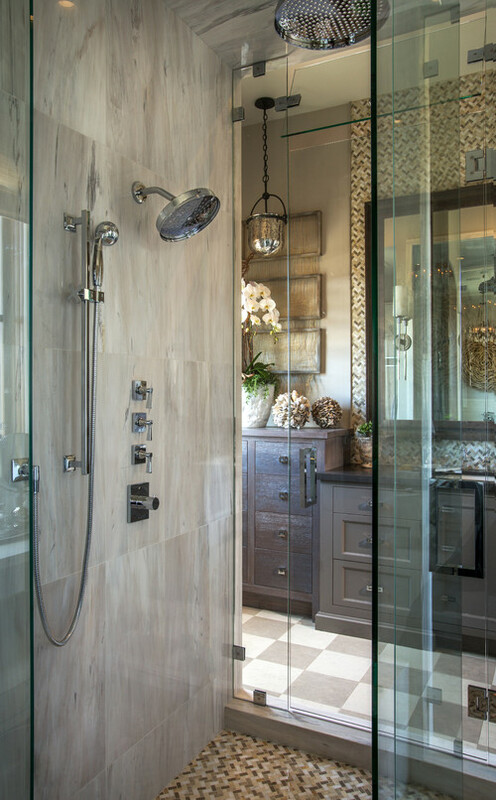 Above: A separate shower is a must if you have the space. 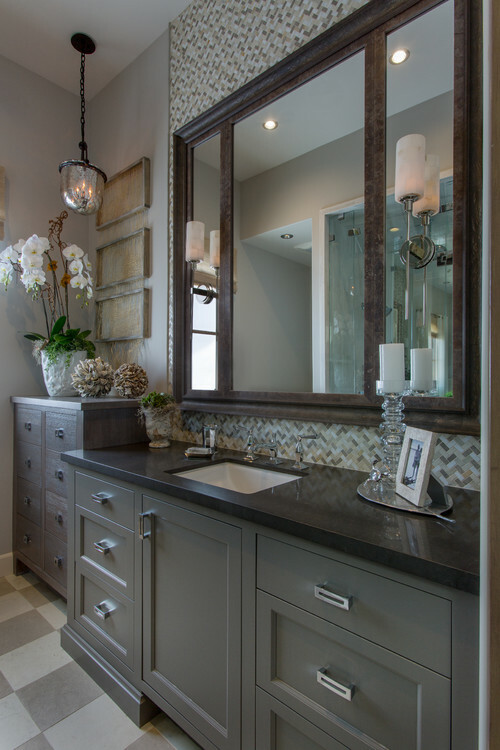 Contrasting tiles can add interest and design to a bathroom. A rain head adds luxury. 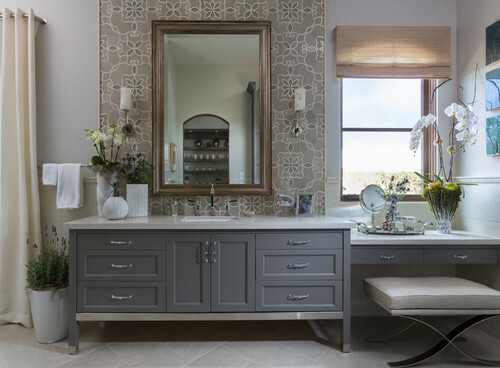 I hope you have enjoyed this gorgeous space and if you are designing a new bathroom or renovating, hopefully Cindy's beautiful and functional design has inspired you.